Coleraine Borough Council’s regeneration project at West Bay Promenade Portrush, was officially unveiled to the public on 5th June. The £1 million enhancement of the Promenade has created a high quality, modern urban environment for everyone to enjoy. The public realm improvement works included the resurfacing of the 1100 metre promenade; replacement of the guardrails; the addition of new high quality lighting and extensive bespoke seating. The improvement work also includes enhanced beach access for everyone and the provision of modern public furniture. Mayor of Coleraine, Councillor David Harding said: “The West Bay Promenade scheme is a significant step forward in delivering Council’s vision for Portrush through the Portrush Regeneration Strategy Western Peninsula. “The area is a vibrant and welcoming public space for the Borough’s residents and the many visitors we seek to attract. Everyone will be able to walk and cycle safely in the area having mutual respect for each other’s space on the promenade. “We will seek to maintain the same high design and build standards in all aspects of the Portrush regeneration programme as we continue to progress”. Alan Clarke, Northern Ireland Tourist Board, Chief Executive, said, “West Bay is an important initiative in helping to promote and sustain tourism for Portrush and I’m delighted that NITB is able to support this project with funding from the European Regional Development Programme through the Sustainable Competitiveness Programme for Northern Ireland. 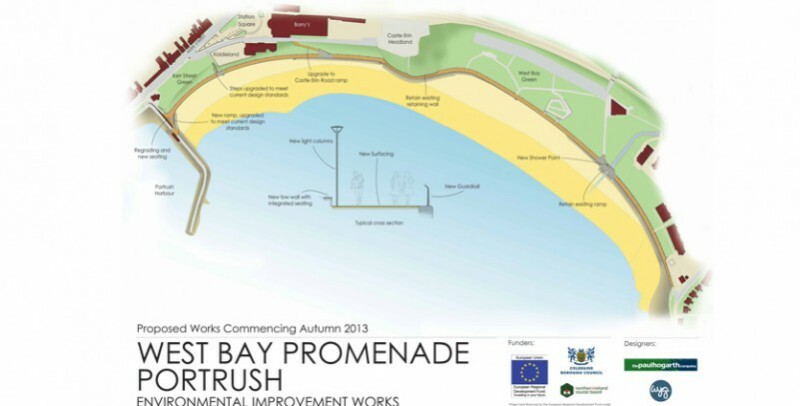 The contract sum for the West Bay Promenade Environmental Improvement Scheme is £1,024,278 with matched funding provided from Coleraine Borough Council and the Northern Ireland Tourist Board with EU funding through the European Regional Development Fund administered by the NITB. Newtownstewart Construction Ltd. was appointed as the contractor to deliver the public realm scheme. White, Young and Green designed and provided the project consultation team. Media enquiries to Coleraine Borough Council PR Department on 028 7034 7042. The promenade will be fully open over Easter although some sections of the final surfacing and guardrails will not be completed.The scheme is heavily weather dependent but there is every expectation that practical completion will be achieved by the end of April 2014. Night time access to the West Bay Promenade Portrush is closed with immediate effect and will remain so until Friday 17th January due to an electrical lighting issue. This matter is beyond Council’s control and is being repaired as quickly as possible. Council apologises for any inconvenience. The contractor is currently excavating a trench for the electrical conduits along the inner edge of the entire promenade resulting in a narrower but passable pedestrian/cycle access. Council have engaged Newtownstewart Construction Ltd. to undertake the environmental improvement works. The scheme is scheduled to be completed in April 2014. It is the intention of Council and the contractor to maintain safe beach access throughout the winter. Following detailed off-site preparatory works the contractor commenced on-site on 27th November. The steps from Castle Erin Road to the promenade are currently being reformed. While the promenade remains open during these works, the contractor’s operatives may direct the public to use the beach for the section adjacent to the steps on occasions. The project seeks to improve the promenade with the provision of new handrails, seating, signage, surfacing and an ‘access for all’ at the northern end of the West Bay beach. A comprehensive public consultation process was conducted during 2012 with the detailed design being approved by Council in May 2013. Several structural surveys, a geophysical survey, topographical survey and drains CCTV survey have been undertaken. The proposed scheme was submitted for planning approval and the construction contract is currently being appropriately procured. The Northern Ireland Tourist Board have issued a Letter of Offer made under the European Regional Development Fund (ERDF) through the Sustainable Competitiveness Programme 2007-2013. Subject to statutory approvals and Council approval the scheme should commence in September 2013 and conclude in March 2014. It is intended that the beach will remain accessible throughout the construction period. Inconvenience will be kept to a minimum however a degree of flexibility from the public will be required as safety is paramount in the context of the extensive construction site. Project part financed by the European Regional Development Fund under the European Sustainable Competitiveness Programme for Northern Ireland. If you would like further information, please contact us at Regeneration Team.